It is situated on the southern point of the island, near to Punta Crepazza. This uncontaminated paradise can be reached only by boat. Its main characteristic is that is particularly sandy, with some pebbles. Its crystalline waters are perfect for snorkelling, i.e. swimming in surface, using a snorkel. It is a beach which extend along the coastal part full of creeks and bays, which follow each other as far as the rock of Lipari, not far away from Marina Corta port. Canneto Beach, 3 km northern away , is situated on the eastern coast of the city. Almost covered with gravel, partly mixed to sand, this beach is framed by a charming bay, and is perfect for immersions in clear and turquoise water. The main characteristic of the coast is not only a small width, but the length. This beach is partly equipped with umbrellas and beds. 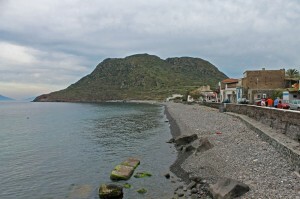 Acquacalda village of Lipari, on the northern coast of the island, gives a name to the near beach. The majestic white mountain of pumice dominates the beach, and is a rarest natural masterpiece, with the caves, which are really unique in Europe, beyond the Turkish one. The natural landscape recalls the idea of wild nature. The cave zone of obsidian and pumice, represents a background for Papesca Beach. It is situated on the north-eastern coast of the island. It is possible to see old bridges used to charge the extracted minerals and the remains of mine infrastructures. The crystalline waters are a mirror of the white blinding panorama of the coast , the colour due to pumice stone. Some kilometres northern of Lipari, there is Porticello Beach. It is an equipped beach covered with gravel, characterized by the presence of white pumice. On the left side of the sea it is possible to admire the caves of Campo Bianco, and on the right side, as a contrast to white colour of pumice, the shining black obsidian coulee of the Rocce Rosse. On the opposite coast of Lipari there is the Valle Muria Beach, considered together with Bianca Beach, one of the most beautiful beaches of the Aeolians. It has a particularly extended conformation, and it seems to be quite wrapped by rocky hills, from the artistic point of view. The beach is reachable by boat from Marina Corta port. The most beautiful beach of Lipari is Bianca Beach. The seabed, formed by pumice sediments is a rarest show in the world for each tourist, and it surely increases the desire to spend the holidays in these fantastic Mediterranean places, Italian and world pride. The sea is particularly warm, of an intense turquoise colour; upon it the piers, once used for a transport of extracted material, are extended.